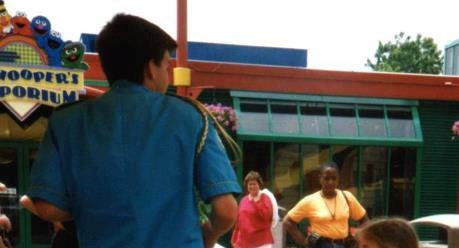 The image is undated, but based on the uniform of the Sesame Brass band member in the shot, it's likely from the late 1990s. The sign shows Bert, Elmo, Grover, Cookie Monster and Oscar the Grouch. It's likely Big Bird and Ernie are far left just out of the shot. The store is still open, now with a sign that features Ernie, Bert, Elmo, Oscar, Zoe and Grover.